Talpids seem like an unlikely ally in a witch's work, unfashionable and unmentioned in contemporary magic where she enjoyed relative renown in old-world occultism. 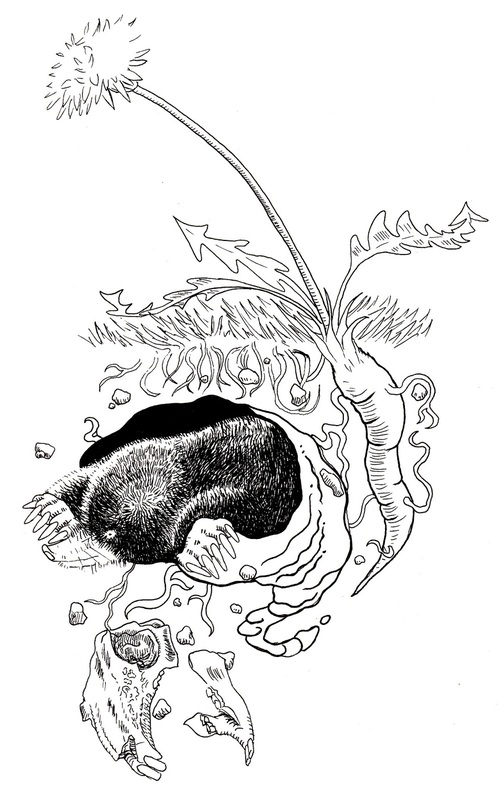 The folklore of the mole in both Europe and North America paint this spirit as lucky, prescient and medicinal in nature; both physical and metaphysical. When we look to the history of the mole in Western lore, we come to some fascinating and even gruesome approaches to working with moles on a magical level- it is part of the healing magic of mole-lore, this ritual of sacrifice, as distasteful as some may find it in the modern day. The mole engenders a great deal more taboos regarding its treatment for its medicinal and otherworldly properties. It should be noted that the nature of mole magic appears to largely by sacrificial means, violently at that; the power must be wrestled or smothered or cut from the ally. 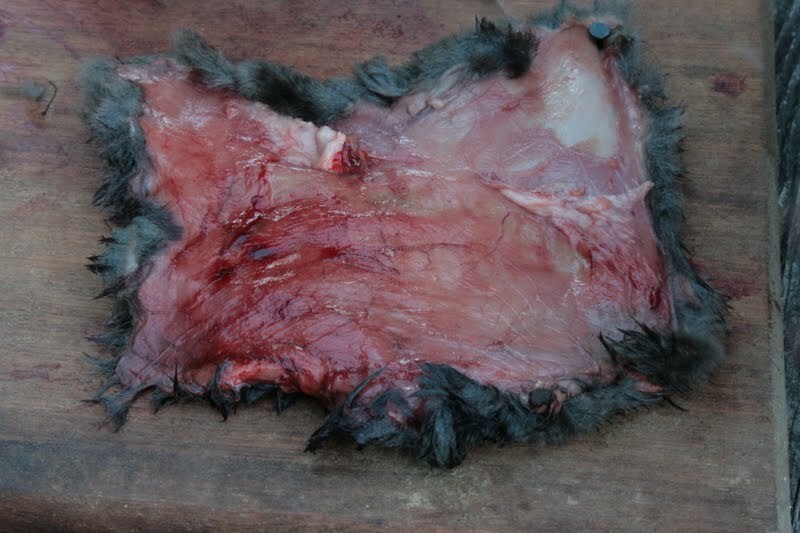 However, I have not noticed the same trend or principle in some indigenous Northwest spiritual systems which appear to follow a more purely animistic approach, including taboos regarding the harming of or devouring of mole for those who become touched by mole medicine. However, throughout the American South and Midwest, the (largely of European and African influence) folk magic of talpids is steeped in blood and flesh and ripping and suffocating and sacrifice. In it said in Roma lore that, "moles never touch the earth that has been stained with blood." Strange lore given the talpid as a carnivore and man's violent relationship with the creature, but then again, the superstitions of lore believed moles to be blind, which typically they are not. I can't imagine anyone would enjoy the flesh of moles, it smells rotten as it cooks. Most accounts regarding the consumption of mole suggest the devouring of the raw, fresh, bleeding and beating heart of the mole in one swallow, gaining a number of powers in reward for doing so. The heart, head, liver, flesh, entrails, teeth, paws-- truly the entire creature is believed to have curative, oracular and protective virtues in every sense. As someone who burrows along the tunnels of the mole spirits, I appreciate the mole as the symbol of introverted diviners, strong healers and vicious guardians; all my kin. "The supposed blindness of the creature, a view established in classical times and persisting to the present, its sheltered and solitary life, and its acute sense of hearing have invested the mole, in popular fancy at least, with divinatory powers, but particularly with the power to predict death." 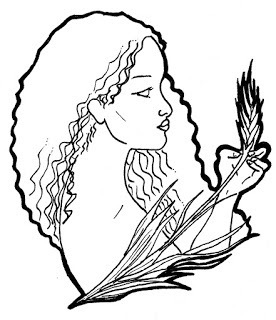 Those who have handled moles and/or been handled by the mole spirit know well the otherworldy prescience of the mole; she seems ever aware through sheer connection to the earth and the roots within of the comings and goings of the world. The bones of history seep down into the earth, where she labors and moves. Moles are asocial and reflective creatures, cunning and surprisingly vicious. 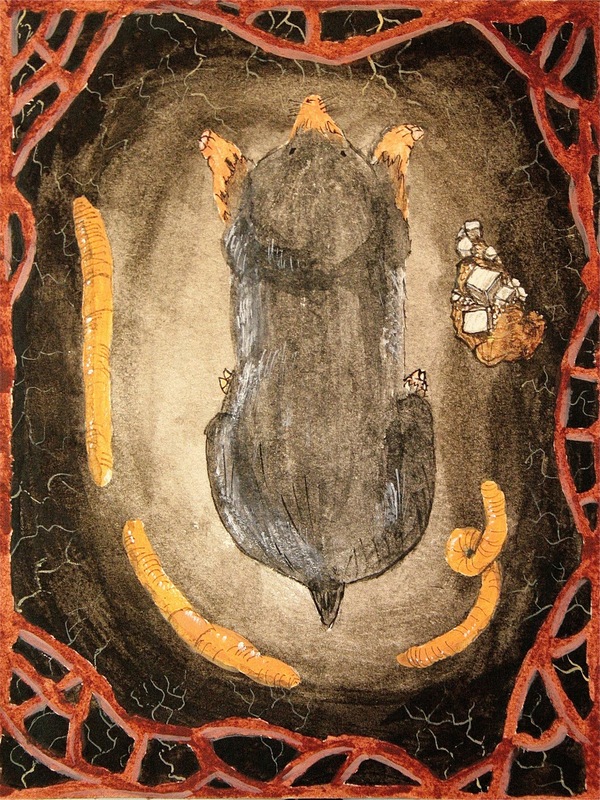 I've enjoyed working with the mole in my oracular work, including during cartomancy sessions, it gives me a sense of sight even in the darkest visions. Moledaughtering includes leaving worms on the mole mounds in the yard, sometimes I just sing out into the night, in the dark. 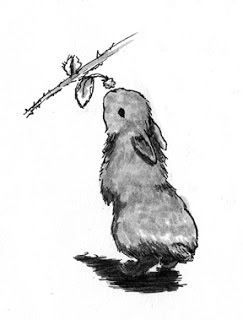 I'd never think to harm the mole, that's part of the taboos of those animals with which one works on this level; all of my gifts are received through scavenging in the garden and trade. 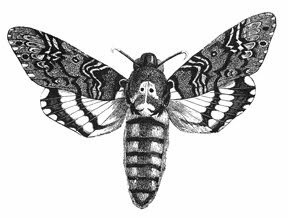 Their nature is solitary and observant, underestimated and shy, and they are best approached in one's own territory, in the garden and wherever they build their mounds. Quiet reflection as you watch their slow, quiet work is a good way to acquaint yourself with the introverted nature of the mole. They aren't interactive teachers; they're a mystery school and I don't interfere, just watch. I commiserate on that level- preferring my own company and some earth to dig in, and so nothing need be spoken. Moles know what's up. "If any man shall have this herb (swallow wort), with the heart of a mole, he shall overcome all his enemies and all matters on suit and shall put away all debate." 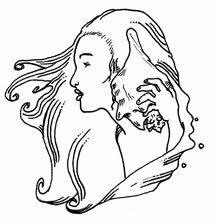 The mole, when her heart is consumed, was believed to grant immediate clarity, while squeezing the life from a mole (popular in Eastern European and even French folklore and then revived in German American folk-magic) in sacrifice granted the ability to heal with that hand (a hand of power). The idea that a hand that takes a mole's life through superior force of strength would be granted healing powers was so pervasive it found its way clear across to the American South among hoodoo practitioners and to the European Pennsylvanian settlers and is attested to in the folklore of those regions (Hand, Wayland). "When a human being takes hold with his right hand of a live mole and keeps the mole so long with a tight grip until it dies, such a hand obtains by this miraculous proceeding, such marvelous power, that cancer boils, repeatedly rubbed by moving up and down with this hand will burst open, cease to form again and entirely vanish." But also, English and Scottish folklore tells of mole as a healer; if one is to carry the hand of the mole itself- its paw. This paw, especially when combined with other healing fetishes was said to guard against or even cure all sorts of ailments including tooth aches and arthritis. 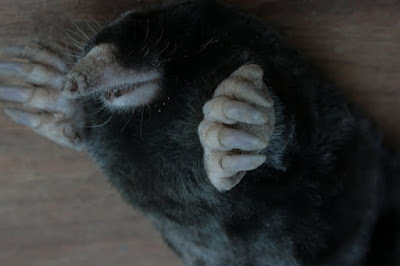 The paw has a particularly well known use but Pliny the Younger and Paracelsus also described the liver, head and body of moles themselves as having a plethora of healing qualities when administered in particular fashion, and indeed they were used extensively in the healing of animals and humans alike using the organs, skin and flesh of moles. In Southern and Midwestern American folklore, the mole's paw will guard one against the evil eye and was also an amulet to protect children from all manner of well known childhood ailments like colic and toothaches. The blood of the mole was said to cure warts (Hatfield, Gabriel). The mole spirit is helpful to those they connect with it seems, by any cultural standard and here in the Northwest, the mole enjoys a reputation for good medicine. "Alternatively, North American Quinault shaman Sammy Hoh valued his helping spirit in the form of a mole for its digging abilities, telling anthropologist Ronald Olson that when he was attacked by another shaman, who has sent a spirit to 'block the path' and prevent his (Sammy's) return from a journey into the spirit worlds, he was fortunate in having Mole for a spirit, who was of course able to burrow under any obstruction'." Obtaining mole volts the old way may no longer be tasteful for most pagans and in most places there are laws regarding how one handles pest-status animals, so I strongly suggest working with those materia surrounding moles and their magical/medicinal properties; these include the soil of the mole's hill which is used in ointments for muscle and nerve soothing (Marcellus of Bordeaux) as well as whatever seeds and stones which are pushed up by moles as they are considered gifts or good omens. "Wearing the bone of a mole under the left armpit is a protection against witchcraft." However, if one does come into possession of a mole's body through natural means and scavenging; mole's teeth make fetishes to guard against illness and harm and the tooth of the live mole was said to be utilized in Midwestern folk magic as a form of transference to remove a child's toothache (Hand, Wayland); the dehydrated heart, powdered and kept in a bag is used in matters of persuasive charms. 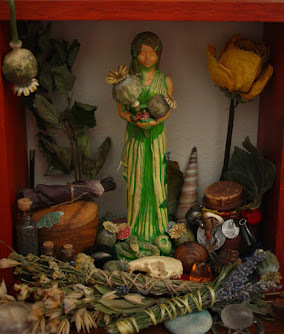 The liver is said to aid in speech and the dried paw kept in a small bag with the sacred herbs of the mole, her bones and related materia will conjure the aid of the mole spirit when one is lost and needs to foretell the best outcome. Sometimes those allies to which we owe a great deal of passion are the unassuming kind. It's okay. Those kindred, like the mole, they teach us that nature's introverts and solitude-seekers, independent and vicious, knowing and listening are all around us, even beneath us at this moment, following their own way and fearing no darkness. Me and the mole know the score.